On Saturday, October 21, General Dynamics NASSCO hosted a christening and naming ceremony for the Navy’s newest Expeditionary Sea Base, the USNS Hershel “Woody” Williams (ESB 4). 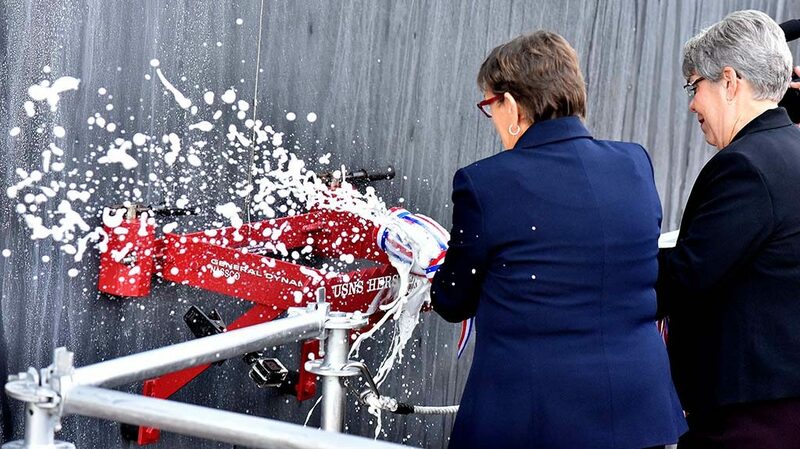 The ship’s namesake, Hershel Woodrow “Woody” Williams, spoke at the ceremony, and his two daughters, Travie Ross and Tracie Ross, officially named and christened the ship with the traditional break of a champagne bottle alongside the ship. Williams, a retired U. S. Marine, received the Medal of Honor for his actions in the Battle of Iwo Jima during World War II. He is the last surviving recipient of the Medal of Honor from that battle. Several dignitaries provided remarks at the event, including Sen. Joe Manchin; Major General Eric M. Smith, Commanding General, 1st Marine Division, U.S. Marine Corps; Rear Admiral William J. Galinis, Program Executive Officer, Ships, U.S. Navy; and Vice Admiral Dixon R. Smith, Deputy Chief of Naval Operations for Fleet Readiness and Logistics, U.S. Navy. USNS Hershel “Woody” Williams is the Navy’s second ESB ship. The 784-foot-long ship will serve as a flexible platform to support a variety of missions, including air mine countermeasures, counter-piracy operations, maritime security and humanitarian missions. The ship will provide for accommodations for up to 250 personnel, a 52,000-square-foot flight deck, fuel and equipment storage, and will also support MH-53 and MH-60 helicopters with an option to support MV-22 tilt-rotor aircraft. Currently nearing the end of construction, the ship will be delivered to the U.S. Navy in February 2018. General Dynamics NASSCO has delivered three ships in the class to the Navy: USNS Montford Point (ESD 1), USNS John Glenn (ESD 2) and USS Lewis B. Puller (ESB 3). USNS Hershel “Woody” Williams (ESB 4) is the fourth ship to be constructed by NASSCO shipbuilders under the program. A fifth ship is currently under construction, with a planned delivery of March 2019, and funding for a sixth ship has passed several Congressional committees. This entry was posted in Christenings and tagged christenings, uss woody williams. Bookmark the permalink.